People outside the diamond trade often misunderstand the relationship between diamonds and color. Many people think of diamonds as colorless. In reality, truly colorless diamonds are quite rare. Most diamonds used in jewelry are nearly colorless with yellow or brown tints—most often light yellow. Diamonds come in many colors other than yellow and brown. Some of the most rare colors are red, purple, and green. With colored diamonds, more color usually means higher value, so the brightest, purest colors are the most desirable. As you’ll learn later, size makes a difference in a diamond’s color—the bigger the diamond, the more obvious its color. The differences in color can be subtle, but they can cause dramatic variations in price. The diamonds that range from colorless to light yellow and brown fall within the normal color range. Within the normal color range, colorless diamonds are the most rare, so they’re the most valuable. They set the standard for grading and pricing other diamonds in the normal color range. Subtle differences in color can dramatically affect the value of a diamond. Two diamonds of the same clarity, weight, and cut can differ in value based on color alone. Even the slightest hint of color can make a dramatic difference in value. The letters in the D-to-Z scale don’t describe actual colors, or hues. Each letter actually represents a range of color that’s based on a combination of tone—darkness or lightness—and saturation—intensity. The combination is called depth of color, and it’s a measure of how noticeable a color is. Diamonds can differ slightly in their depth of color, but still be assigned the same color grade. Color is easier to see in larger stones than in smaller ones. In weights under 0.25 ct., only trained graders can distinguish between diamonds in the D-to- F range—and then only if the stones are not in a setting. When mounted, G, H, and I diamonds might look colorless face-up. That’s why most gemological laboratories don’t grade mounted stones. Part of the difficulty in color-grading mounted diamonds is that the mounting affects the apparent color by covering part of the stone. Another factor that affects a diamond’s apparent color is the color of the mounting itself. Yellow gold makes slight amounts of yellow or brown less obvious, while white metal mountings make the color in yellow or brown stones more apparent. On the other hand, white metals enhance the appear- ance of colorless stones. Face-up and set in yellow gold, J, K, and L diamonds that weigh less than 0.50 ct. look nearly colorless to the untrained eye. The color is easy to see in larger diamonds or when the setting is white metal. Beyond M, most consumers can see color pretty easily. As the grade gets closer to Z, the color is obvious even in small diamonds. Because each color grade represents a range, stones that fall on the borderline between two color grades can be challenging. When this happens, the grader has to make a judgment. 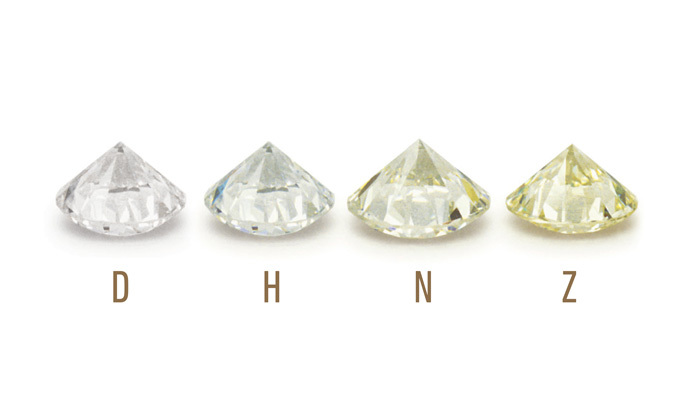 Diamonds in the D-to-Z range usually decrease in value as the color becomes more obvious. Just the opposite happens with fancy-colored diamonds—value usually increases as the color deepens. Fancy-colored diamonds come in almost any color you can imagine. Red, green, purple, and orange are generally the most rare, followed by pink and blue. Yellows and browns are the most common fancy colors. Many fancy colors, however, are not strong and pure. They’re often blended with other colors and muted by grayishness or brownishness. Large, vivid fancy-colored diamonds are extremely rare. They’re also very valuable. Because fancy-colored diamonds come in so many different hues, there are far too many variations to make a complete set of masterstones possible. So when diamond graders grade fancy-colored diamonds, they use a combination of comparison stones and printed standard color references. These tools help them identify the color of the diamond as a whole, or its characteristic color. If you have any questions about color or any other aspects of a diamond, ask our diamond experts here at Moti Kashi Diamonds and they will answer all of your questions.